3 Bedroom Flat For Sale in London for Asking Price £1,495,000. A most beautiful example of its type, this stunning raised ground floor 3 bedroom, 2 bathroom apartment presents an opportunity to own a home of refined elegance, brushed with contemporary flair to enhance its breathtaking original charm. Crafted curved double doors lead from the entrance hall to reveal a quite spectacular reception room with decorative high ceilings, wooden floor, fireplace and a full height bay window with French doors to a wrap-around west facing balcony. The stylish and discreet open-plan kitchen is revealed from behind a blend of bespoke fitted cabinets. The equally impressive master bedroom enjoys generous dimensions and also has a stunning full height bay window. Adjacent is the beautiful full bathroom with stone tiling, bath and separate shower. Bedroom 2, itself a delightful room, is unusually spacious with a bank of fitted wardrobes. Redesigned by the current owner, the new layout provides a versatile 3rd bedroom currently used as a study with fitted furniture. 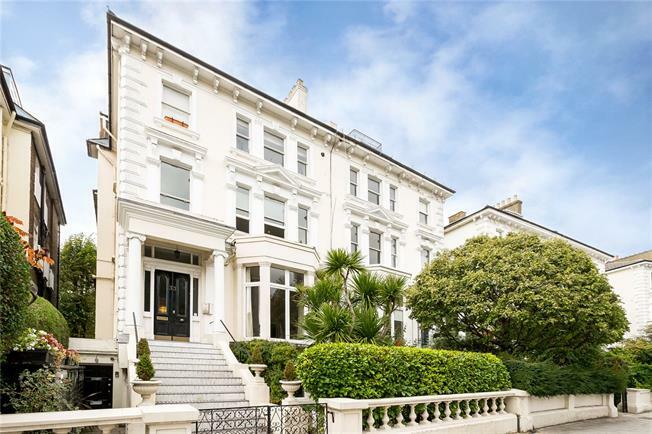 This exemplary apartment enjoys a convenient location accessible to local stores and eateries at Belsize Village, with a choice of underground stations at Belsize Park (Northern Line) & Swiss Cottage (Jubilee Line).